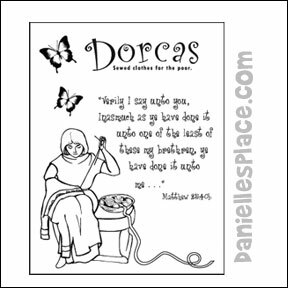 The following crafts and activities come from the Sunday school lessons "Dorcas Serves Others". 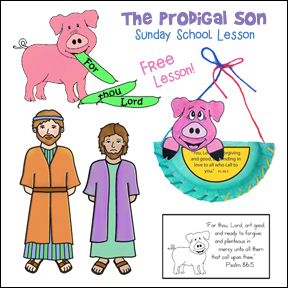 You can find the complete lesson on The Resource Room. Craft foam is a great medium to use to learn to sew. Young children can use plastic children's needles to sew shapes onto fun foam with a little help from parents and teachers. 1. Cut a shirt shape from craft foam. Cut out circles for buttons, pocket shapes, or other decorative shapes. 2. Mark dots on the fun foam around the edge of the coat about a half an inch apart with a black sharpie. Punch tiny holes through the fun foam at the dots using a sharp needle or small hole punch. Turn the coat over and mark dots on the other side of the coat where you can see the holes. Mark the dots farther apart for younger children. 3. 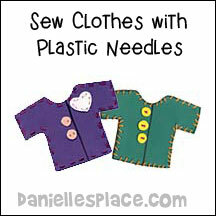 Have the children sew from dot to dot using plastic needles and embroidery floss or yarn. * My 3 1/2 year old child can do this project with some help. I would not recommend doing this project with children under 5 if you have a large group because they will need a lot of help with it. If you want to do this with younger children, cut out a simple shape like a small heart. Put about 10 dots around the edge of the shape and let them practice on that. As you children work ask them if they think they would enjoy making clothes for other people. 1. Before class print out the color sheet and make copies. 2. In class have your children color the picture. Talk about how making clothes has changed since Bible times. Ask your children if they know anyone who makes clothes. 1. 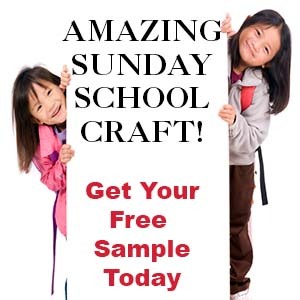 Before class glue a jumbo craft stick and regular-sized craft stick together to form a cross. 2. Cut pieces of fabric using the patterns to make the coats, tunics, and head coverings. 3. 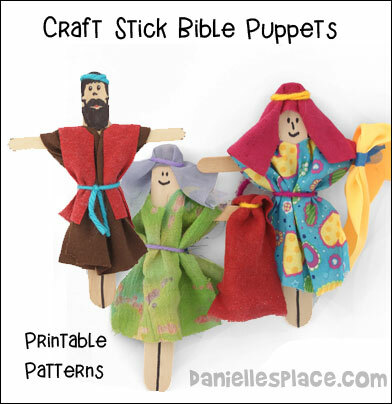 In class let your children pick the pieces they would like to use on their stick puppets. Show them how to place the hole of the coat over the head and then tie it to the puppet with yarn. The tunic goes over the coat with the slit part in the front, and can be tied on with the coat with a piece of yarn. 4. To make the head covering glue it to the forehead of the stick puppet and then flip it over to the back of the head scrunching up the material around the face. Tie it in place with a piece of yarn. 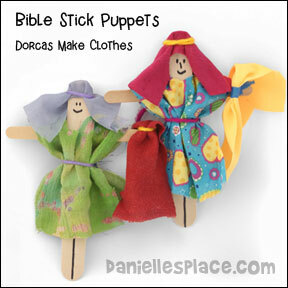 Children will enjoy making their own puppet skits. 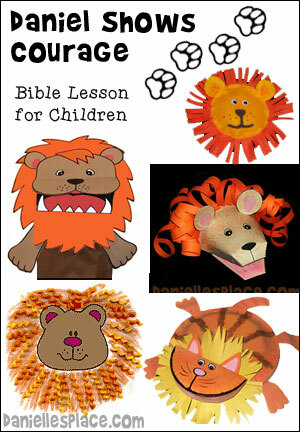 Place them in groups of two or three children and have the groups take turns acting out the story with their puppets. If you didn't make the puppets, you can have them act out the story without the puppets. Assign each child a character from the story and help them write a skit. If you have younger children, you can prepare the puppet skit and just have the children watch the skit, or have your children act it out as you narrate the story. Sprout! - Serving People, Reaching Out! 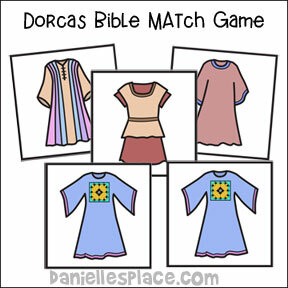 Children can serve people like Dorcas of the Bible by reaching out to their communities. 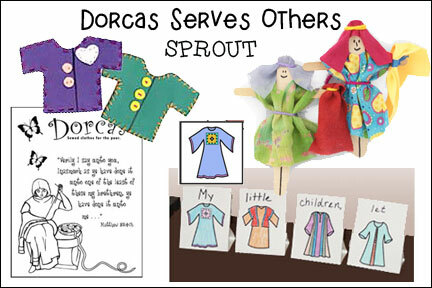 Older children may not be able to sew clothes for the poor, but they can make things using fabric to serve others. Search for no-sew fabric projects for children on the web. 1. Before class prepare the game pieces. Print out the game pieces onto card stock (heavy paper) and cut them apart. 2. Make them into game pieces that stand up by folding the cards where indicated (see the diagram below). Tape the folded bottom of the paper to the back of the paper to make a stand. 3. Print one word of the Bible verse above each picture to make the verse. .
4. In class place the game pieces in front of the room on a table or floor with the words and clothes pictures visible. 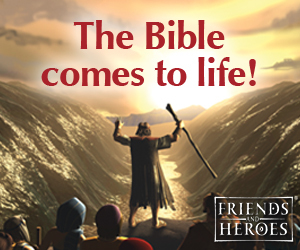 Place the letters in order to spell out the Bible verse. In class have your children stand about ten feet from the game pieces and throw a bean bag or ball at them to try to knock pieces backwards so that they piece fall over backwards and the word is not longer visible. 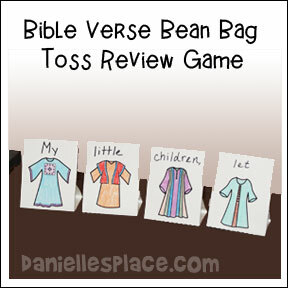 After a child has thrown the beanbag and knocked over a word, he should say the verse. Keep playing until all the pieces are knocked over and all the children can say the complete verse without and words visible. 1. Before class print out the game cards onto card stock (Heavy paper) and cut them apart. In class places all the cards face down on a table. Have your children take turns turning over two cards at a time to see if they match. If the two cards match the child gets to keep the cards. If the cards don't match, turn them back over and the next child takes a turn. The child with the most cards at the end of the game wins. 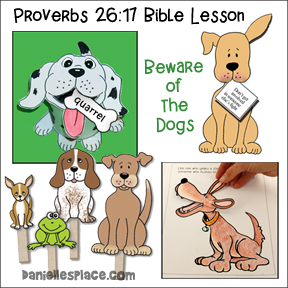 Older Children - Write different words from the Bible verse on the front of the cards. 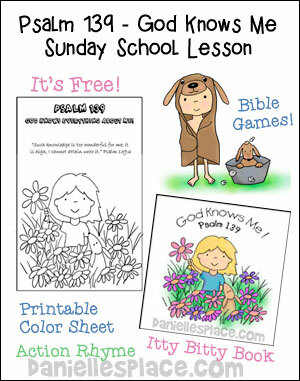 At the end of the game, have your children place the cards they collected in order to spell out the Bible verse. the children who has the most words from the verse and can say the verse wins.